What is the problem/issue that was addressed? 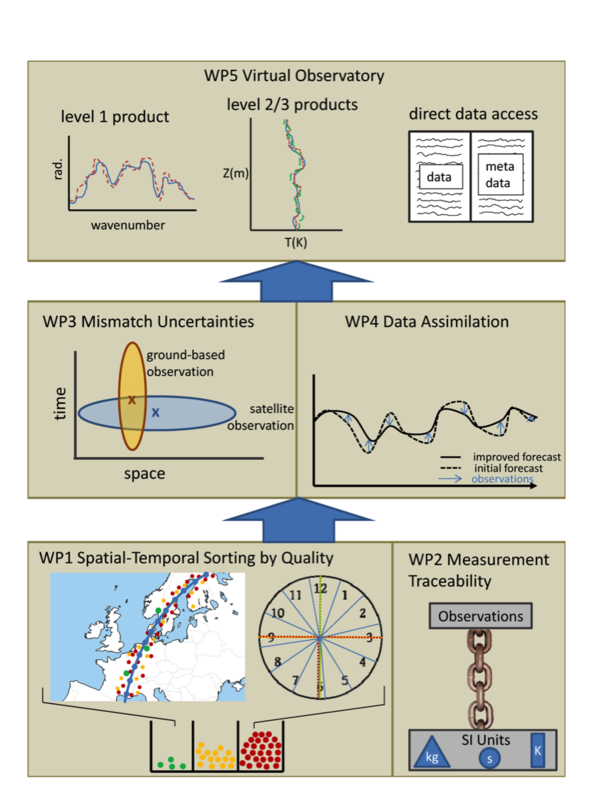 The H2020 GAIA-CLIM project (2015 - 2018) aimed to establish sound methods for the characterisation of satellite-based Earth Observation (EO) data by surface-based and sub-orbital measurements (non-satellite measurements). The Copenicus program activities, if successful, shall enable a step-change in our ability to use and exploit environmental data to the benefit of society. A crucial component of the Copernicus framework is provision of high-quality observational datasets from satellites. These need to be calibrated and validated to standards that enable them to be used with confidence for applications. This requires ancillary datasets from in-situ and other sources of high-quality and sufficient quantity to robustly characterise sensor performance and radiative-transfer modelling. The challenges to rigorous satellite-data characterisation are formidable, because without traceability in the comparator measures, there is ambiguity in any comparison. What were the overall objectives? The objectives of GAIA-CLIM were to play a full role in supporting Copernicus. Firstly, by taking concrete steps to improve our capabilities to exploit current non-satellite observations to characterize satellite data. Secondly, by establishing prioritized needs for further observational capacity targeted at providing the required step-change in satellite calibration and validation capability. The consortium brought together scientific, technical and leadership expertise in high-quality in-situ and sub-orbital observations, gap analyses, modelling, satellite operations and data assimilation, and in setting the priorities for the EO community. Robust EO instrument characterisation is about significantly more than simply where and when a given set of EO and ground-based / sub-orbital measurements is taken. It requires, in addition, quantified uncertainty estimation for the reference measurements and an understanding of additional uncertainties that accrue and increase the apparent discrepancy between measured data sets through mismatches in spatio-temporal sampling. It is also about enabling like-for-like comparisons through data transformations such as simulation of Top-of-Atmosphere (TOA) radiances. Finally, it needs user tools, which include statistical tools and the integrating capabilities afforded by data assimilation systems, to enable users to access and work with the data, including the uncertainty information. GAIA-CLIM has shown how this could be approached via its ‘Virtual Observatory’ demonstrator tool for a selection of well characterised ground-based / sub-orbital measurements and satellite co-locations. Define data quality by assessable attributes, such as traceablity, documentation, metadata retention, uncertainty quantification. Improve understanding and uncertainty quantification of selected in-situ, ground-based, and sub-orbital measurements. Better quantify the impacts of inevatable measurement mismatches between satellite observations and the non-satellite measurements . Use Data Assimilation to improve the usefulness of high-quality measurements in characterising satellite performance. Provide useable and actionable both satellite and non-satellite data and tools to end users to improve their value for a broad range of applications.